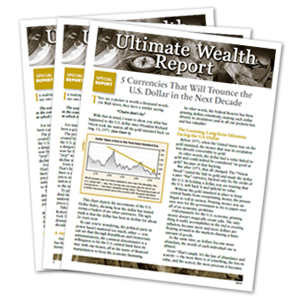 The Ultimate Wealth Report is designed to provide you with the information you need to build your own Ultimate Wealth Portfolio. By playing the trends that are reshaping the future global economy, you can profit handsomely by owning real assets that the world vitally needs — assets that, unlike stocks or real estate, will never lose all their value. It will enable you to combat the perilous economic moves of the government — and even profit from their errors in judgment — by buying commodity-based exchange-traded funds, commodity-related stocks, stocks that benefit from rises in foreign currencies, and foreign currency ETFs. The problems our economy is dealing with won't simply fade away. If anything, they'll multiply as the government is forced to raise taxes, and businesses face the triple threat of inflation, taxation, and cash-strapped consumers who cut back on spending. But you do have a choice: Either accept the low-interest crumbs offered by bailed-out banks and other financial institutions, and continue to be a victim of the government's failed economy policies at the expense of your financial security, or . . . salvage your financial future by adapting to the new global economy . . . by joining the Ultimate Wealth Report. These investment plays may be a bit "renegade" in nature — they're not part of the typical investing "advice" you hear from "experts" and cable TV pundits — but they can greatly improve your financial prospects in an uncertain economic climate and generate loads of cash. To join the service today, simply fill out the form below and become the newest member of the Ultimate Wealth Report.